The reason we globalized in such a radical and rapid way in the 90s with the World Trade Organization is because we wanted the human capacity of Asia to build a multiplanetary civilization. We needed three billion people with higher IQs than the Western world to create massive amounts of engineers to radically up our game in terms of technology and capacity because something is going on in this planet that leads people to believe in 100 or 200 years the planet is going to die and so our number one risk is there. A geophysical risk on this planet. “The worst case scenario is we are dealing with very serious geophysical risk. Throughout history, we have had things like Noah and the flood where civilization has almost gotten wiped out. . . . There have been radical changes in policy to coalesce huge amounts of money under central control and do secret projects. What is that about? . . . . I don’t know how the governance system on planet earth works. 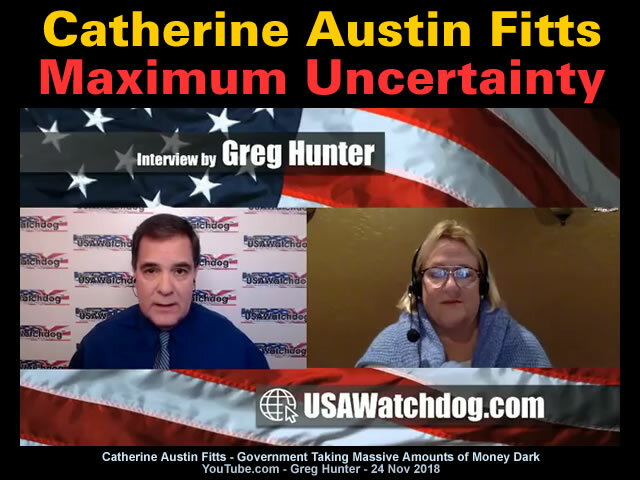 Catherine Austin Fitts is the president of Solari, Inc., the publisher of The Solari Report and managing member of Solari Investment Advisory Services, LLC. She has also worked as the president of Hamilton Securities Group, Inc., an investment bank and financial software developer. She was Assistant Secretary of Housing — Federal Housing Commissioner at the United States Department of Housing and Urban Development in the administration of President George H. W. Bush. Perhaps the US Government really was drinking it’s own Global Warming kool-aid. Gallery | This entry was posted in Atmospheric Science, Catastrophism, Economics, History. Bookmark the permalink. Tom Luongo, once again, hits the out of the park. I would hope, at the very least, they are thinking of something thoroughly inert like barium sulfate, but they aren’t. They are talking about injecting SO2 into the atmosphere. Another word for SO2 is SMOG. This is the very compound we have been regulating power plants to not emit. a nice cozy, warm home with abundant food and mild weather for most of the planet. The USA has been plundering ancient items. Their freemasons have had access to the unpublished old testaments. ElectroMagnetic Force is the basis for the Universe and all things within it. Gravity is merely the aether aka quantum foam pressure. The solar system is a powered assembly and the filament supplying that power, like all others, continues to grow making the star tighter and brighter. From Red to orange to yellow to green. Constricting the star may mean ejection of planet(s). We may find that we were the last planet to have surviving life on it, or else we may have strange new allies. Far worse than fake warming….. If you want to improve the IQ of a population the first move is to delay the age of the first child women have [and educate them first], the average optimum being about 25, but the optimum moves higher with the generations. Alternatively you can make the population really stupid very quickly by encouraging children to have children, perhaps the optimum way to achieve that is to introduce oestrogens into the diet in sufficient doses to bring menses forward by about 1/3. In 1947 oestrogens were introduced into the diet of dairy cows to bring them into oestrus a season early, 18 months instead of 24 IIRC. The same effect was noticed by the mothers of girls who grew up in the 50s. Worst case, some thought it was a good idea to go the way of the social insects, dumb down the population, confuse them with endless alternative storylines, reward only those who swallow the mainstream ideology, limit their perception by introducing mind limiting agents into the food chain/water and compulsory medications. Neuter the males chemically castrate them before birth, introduce mutagens into the diet to impair those that can breed, keep up an endless stream of propaganda about all the efforts everyone is making to improve things, and fill their still enormous minds with trivia and set some of it to music to get it to endlessly repeat. Build underground bases so that when the time comes all opposition can be eliminated without risk to the ‘Royal’ lines. This thread and the video have some interesting ‘lessons’. (another lesson is never to press tab because what is scrawled gets posted without correction – sorry). 1 It is daft to build underground bunkers to protect from a flood – unless one is a goldfish. The Sumerians who lived in flat lands built ziggurats. Noah built a coracle, because he knew what was coming; but see below for how he knew. In seismically active times stay under a straw hut. 2 For prospective authors the book mentioned “Ringmakers of Saturn”, which is today worth ~$900. That is a good kill, and some strategy!. Dimming the sun IS harebrained. But since Dodwell was dumped, my deductions are wasted. Archaeology left us important info. Between 6.2k bce and 2.2k three obliquity swings are recorded. From ~14deg to 18(?) to 14 to 24. Dodwell sensed the last change. The next coming is back to a lower tilt angle (when polar ice is gone?? ), meaning cold above the new lower tropic, but fire between tropics – a burning land – . When — I hope long after I’m gone (which does not mean much since I’m 73). Remember Plato. Nothing much really, but coming round to the thinking that it can shift orientation begins to ‘rehabilitate’ Dodwell.